Traditionally the ‘live fast, die young’ attitude has been synonymous with rock music. The glamour associated with bowing out early has always allured youth cultures and often dying early can add to the mythology and, importantly, the subsequent veneration of the dead hero’s talent. It seems that hip-hop, often a genre obsessed with its legends and, oddly, death itself (think Notorious B.I.G.’s Ready to Die album or 2Pac’s Machiavelli period) can now boast similar fast-living, early-dying credentials with the deaths of 2Pac, Biggie, Big Pun, Proof (of Detroit group D12), Jam Master Jay and others all taking place in the last 20 years. In 1997 Puff Daddy, Faith Evans and 112 all came together to record I’ll Be Missing You. The song would become a huge seller which would go Number 1 across the World. Using a haunting sample from The Police’s generally haunting I’ll Be Watching You, Puff Daddy takes a retrospective lyrical look at his time spent with his (at the time) recently deceased friend and musical collaborator; Notorious B.I.G. (formerly Biggie Smalls, real name Christopher Wallace). Faith Evans (Biggie’s girlfriend) sings the chorus, which mimics Sting’s Police chorus melodically with a slight lyric change, while 112 chip in with the melancholic outro. The significance of this song as both a huge selling hip-hop single and, more importantly, the Biggie Smalls legend maker was huge. The shooting of Biggie’s rival emcee 2Pac (real name Tupac Shakur) the year before caused an outpouring of public grief, but with the release of I’ll Be Missing You, the legend of not only Biggie was made, but the legend of the story of Biggie and 2Pac’s rivalry was made. Beyond that the legend of the dead rapper was made. 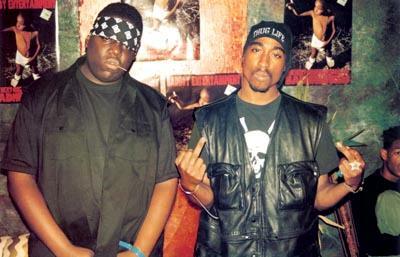 In 1996 and ’97 the two best rappers around (oft cited as the greatest ever rappers) were killed. Upon the release of Puff Daddy and co.’s emotional marketing masterpiece in ’97 the rap game would change forever. Suddenly it was as cool in hip-hop to be a dead hero as it had been in rock ‘n’ roll. I'm not saying here that Puff Daddy (as he was then known) set out to make money and create a culture of 'it's cool to be dead' in rap, but I am saying that as a by-product of his ode to his friend, both happened.